Qosmedix's Nail Clippers come with curved blade. Qosmedix offers stainless steel medium (fingernails) and large (fingernails and toenails) Nail Clippers and stainless steel Flexi-Scissor. These clippers feature ergonomic handle. The scissors comes in reusable PVC pouch and is used for grooming brows. 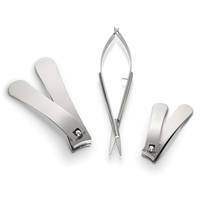 Diane® Nail Clippers are made of stainless steel material. 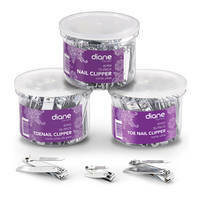 Diane® Nail Clippers are available in Diane® Nail Clippers 72-Pack (Part # 513644), Diane® Curved Toenail Clippers 36-Pack (Part # 513645) and Diane® Straight Toenail Clippers 36-Pack (Part # 513646). These units are suitable for salons or as a retail item and come in clear reusable container. Products feature a fold-out nail which file and clip nails evenly and sharply.